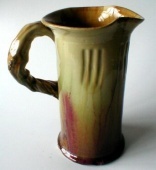 172 (Early Series) Cylindrical jugs. Does this shape appear in other series? Yes - 172/5M is like Pamela Series 18. There are also numerous early un-numbered examples including commemorative pieces and pieces with completely unmarked bases. Some un-numbered examples are recorded dated 1933. A copy of the shape is also known to have been made in Japan, presumably being considered an item that would sell in the Australian market. According to the shape book there were four sizes, denoted by inch suffixes 5, 6, 7, and 13. 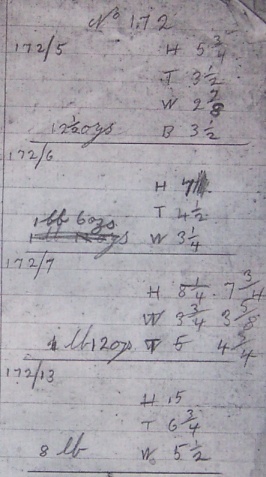 Only 172/5 and 172/6 are yet recorded in the image database. Both were produced with and without applied decoration. Decorated pieces were suffixed 'M' although a few examples are recorded with no 'M'. Height; 12.5 - 13 cm. Height; 15 - 17 cm. Like 172/5M but stamped "Made in Japan"! Listed in the shape book (below) but no numbered example is recorded in the image database. Height, from shape book; presumably about 7 inches (17.5 cm) or slightly taller. Height presumably about 13 inches (33 cm) or slightly more. Vertical scoring and early handle. Base unmarked. Early gumleaf Later gumleaf - veined. Shape book 'C' (shown here) lists four sizes. Shape book 'E', however, which comes from a slightly later date, lists only three; 172/13 had apparently been dropped. Even taller; height 20 cm.